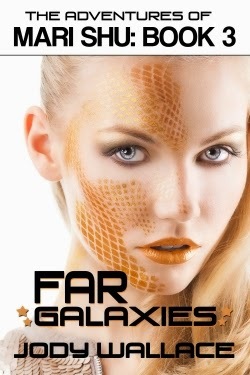 FAR GALAXIES, coming soon to an ebook venue near you, is the third installment of Jody Wallace's interactive and spooferific sci-fi romance series The Adventures of Mari Shu. Behold the cover and blurb for this cosmically cracktastic story! About the book: Mari Shu, a factory drudge in the year 4000-something, must choose how to protect her sisters, her purity, and her own conscience in a bleak futuristic society that’s been polluted by smog, rampant commercialism, tacky jumpsuits, sexual perversions, unjust socioeconomics, interstellar travel, and inconsistent use of the Oxford comma. In this third exciting, universe-spanning adventure, will Mari Shu and her sweet sisters find love or mystery on the SS Rentaprise en route to the planet where they hope to start a new life…or will they fail before the ship ever arrives? Mari Shu has to battle aliens, sexual urges, evil computers, crash landings, and more before she ever gets her happy ending. Warning: Book contains offensive material. Buttloads of boatloads of offensive, vulgar, disrespectful, and possibly triggering material. Sexual, political, economic, racial, physical, typographical, religious—really, trying to hit all the big ones. Please make sure to sign your correct name to the hate mail so we can give proper credit in the follow-up volume entitled, “The Hate Mails to Mari Shu”. For more information, visit the book's page at Jody Wallace's joint.